Are you looking for a competitively priced Florida fly drive package ? Then you have come to the right place !! We recommend Travel Counsellors who are consistent in being unbeatable on service & quality with competitively priced fly-drive packages. Travel Counsellors have announced that they are able to offer guaranteed fares for Virgin Atlantic direct flights to Orlando (MCO), including peak dates and school holidays for up to 2 years in advance. Seats are in Economy Classic only and are available from London Gatwick, Manchester, Glasgow and Belfast airports. Car Hire must be included for the duration of stay. Deposits set at £125.00 per person (excluding infants with no seat). Travel Counsellors' knowledge and expertise also ensure you will get the perfect fly-drive package for YOU, often suggesting routes, hints and tips for making savings that you may not have thought of yourself. They are also specialists in planning and advising on multi-centre trips incorporating other US cities, the Caribbean or adding a cruise to your itinerary. Add to this, the unbeatable FINANCIAL PROTECTION provided by Travel Counsellors. You don't need to worry about a thing because, with Travel Counsellors, every penny of your Fly Drive booking is protected completely by the Travel Counsellors Trust. 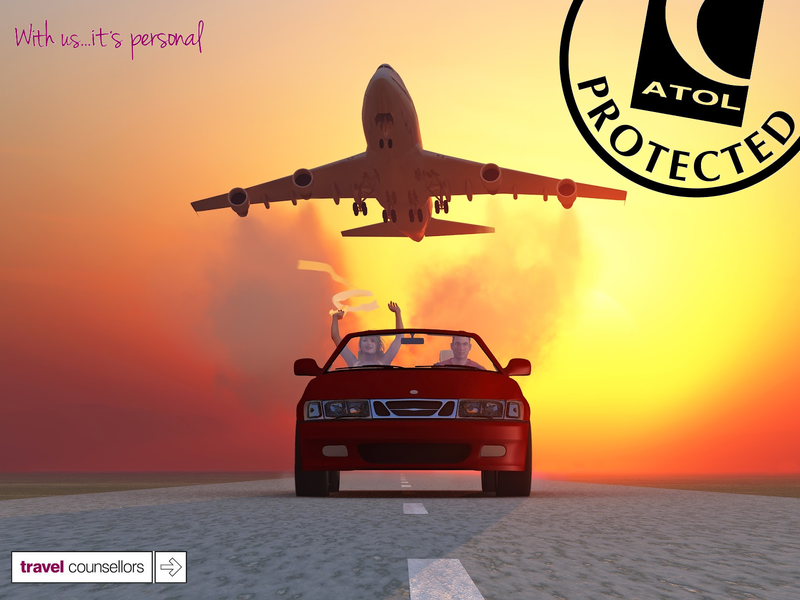 This is in addition to full ATOL protection provided. The chances are, you'll never need it. But if you do - you'll be so glad you booked with Travel Counsellors. Please contact either Donna at Travel Counsellors on +44 (0)1295 275295 or complete the form below and we will contact you to advise and quote you on the best fly drive or multi-centre itinerary for you. Please note that scheduled airlines do not release their rates until 11 months before, so there is no point looking at flight prices until 11 months before your return date. Some charter airlines may release their flights earlier but they tend to reserve their flights for their own accommodation packages and don't normally release flight only or fly-drive sales until they have sold out their accommodation first, at which point they may not that competitive anymore. If you would like us to contact you with a fly-drive quote for dates more than 11 months in advance, please still complete the form below and we will diary your enquiry and get back to you as soon as the flight rates are released. Vehicle Type Not Sure - Please Advise Economy (Vauxhall Corsa sized) Compact (Vauxhall Astra sized) Intermediate (Vauxhall Vectra sized) Full Sized (Vauxhall Omega sized) 7 Seater People Carrier 8 Seater People Carrier Something even bigger !! DONT WANT TO DRIVE IN FLORIDA ? If you don't fancy driving yourself in Orlando, there is an alternative option for you. DO YOU HAVE AN ESTA - IF NOT CLICK HERE to be taken to the official website (beware of bogus websites offering to provide ESTA's for you - the official price is $14 per application). ARE YOU FED UP WITH THE LONG QUEUES IN US IMMIGRATION - DO YOU WANT TO SAIL THROUGH INSTEAD ? Now you can by applying for GLOBAL ENTRY which enables you to have access to the same queues as US Citizens and avoid the long queues in immigration for 5 years - it also enables you to speed up passing through airport security on return flights to the UK with TSA Precheck which means you can go through a fast queue where you don't have to remove laptops & tablets from bags and are cleared quickly. For more information on how to apply for GLOBAL ENTRY click in HERE.